Though it's often thought of as holiday fare, brisket makes an excellent choice whenever you're feeding a crowd -- or just want to have some tasty leftovers on hand for meals or sandwiches later in the week. Cookbook author Ronnie Fein put a new spin on a classic favorite by infusing her kicky barbecue sauce with fresh mango, ginger, and a touch of jalapeño. "With so many no-red-meat eaters in my family," she relates in The Modern Kosher Kitchen, "I don’t make brisket too often, but when I do, I do it up big, using a whole brisket (plus second cut). We prefer it Texas-style: grilled and slathered with barbecue sauce that catches the flames to make those fabulous, blackened 'burnt ends.'" Tip: Though Fein likes to finish her brisket on the grill, you can certainly use the oven if you prefer. Recipe reprinted with permission from Modern Kosher Kitchen ©2014. Peel the mango and purée the flesh in a food processor. Set it aside. Heat the vegetable oil in a saucepan over medium heat. Add the onion and cook for 2 to 3 minutes or until slightly softened. Add the garlic, orange peel, ginger, and jalapeño pepper and cook briefly. Add the mango purée, ketchup, orange juice, molasses, soy sauce, and horseradish. Stir thoroughly to blend the ingredients. Bring to a boil over medium-high heat, stir, and lower the heat; cook, stirring occasionally, for about 15 minutes, or until thickened. Let cool. Makes about 21/2 cups (625 g). Preheat the oven to 225°F (107°C). Place the meat in a large roasting pan and sprinkle with salt, pepper, garlic powder, and paprika. Scatter the onion slices on top. Sprinkle with more paprika. Cover the pan tightly. Bake for 7 to 8 hours or overnight (less time for a smaller brisket). Remove the meat and onions. Let the meat cool. Just before serving, preheat an outdoor grill or oven broiler. 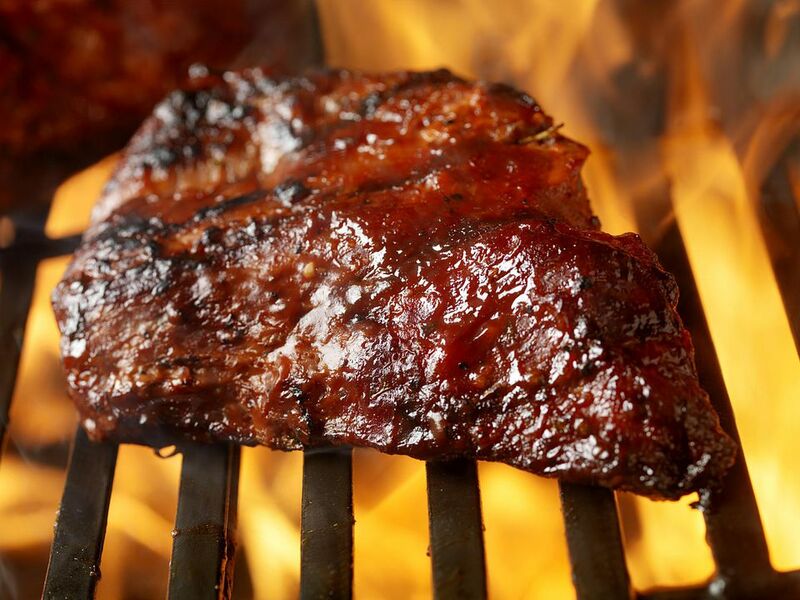 Slather some of the barbecue sauce over the meat and grill or broil for 12 to 15 minutes, occasionally using more sauce as needed. Slice and serve. The simplest way to bake brisket using what you already have in your pantry.